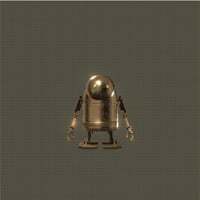 Courageous Brother is a Peculiar Machine enemy in NieR: Automata. "A small golden stubby that is accompanied by followers of the same color. They shout "Glory to machine lifeforms!" as they attack." Has same moveset as a small stubby, proves to be more of an annoyance and a test of will than a tough fight. If you are 9S hack him repeatedly as it will prove much more effective than melee combat, also hacking him is quite easy since he is just a small stubby type. I just fought this little jerk and a golden goliath when arrived at flooded city in the missiles quest, was the third time i came here, but first time i see them. I don&apos;t know if has a story trigger or it&apos;s just random. What an annoying fight, ffs. So I killed all gold machines, completed all quest, but I&apos;m still missing one piece. Is there any chance to respawn gold machine? Met all three on first playthrough when i took quest: "wandering couple"
I believe there is a misunderstanding regarding this sidequest. There are three machine types: the Courageous Brother, the Hateful Sister, and the Vengeful Child. There are only one of each, and each one appears after the preceeding one is killed: killing Courageous Brother spawns Hateful Sister and killing Hateful Sister spawns Vengeful Child. All three of them can spawn in the locations listed on this page. It doesn&apos;t appear to matter which location you visit first to begin the quest, as I&apos;ve initiated it both in the City Ruins and Flooded City. It is a non-logged quest and does not count towards completion, like the Wise Machines quest. Forest Kingdom doesn&apos;t need to be completed- found the City Ruins one at the start of that quest. That said, maybe it just needs activated- didn&apos;t see them beforehand. I confronted said brothers in the 1st play. The first one was when I tried to complete the quest "Wandering Couple" at flooded area. He was accompanied by a Golden Goliath Biped. The 2nd one was at desert just before the entrance of Desert Complexes, accompanied by Golden tank. But my brother confronted only one brother with 2 Golden Bipeds in Ruined City. Do they randomly make appearance? I encountered Courageous Brother along with a Golden Goliath tank in 2nd playthrough as i was leaving the Desert area and heading towards Desert Apartment Complexes.